Market sentiment has been wavering for weeks, but there has been a significant reaction in risk appetite in the days since the Fed meeting last Wednesday. Conventional wisdom would see a dovish FOMC meeting as risk positive, but not when markets are increasingly concerned over the prospect of a global cyclical downturn. Is the Fed dovish or turning bearish? Friday’s flash PMIs showed real concerns in the Eurozone, whilst the US data also missed to a significant degree. Markets are under pressure whilst safe haven asset classes are the place to be now. Gold and the Japanese yen have both benefitted, whilst bond yields have dived. There is now a key signal that many in the market have been worried about for some while. The implications of inversion of the US yield curve is always a hotly debated topic. However, the 3 month to 10 year spread has now gone negative. It now costs more to borrow for three months than it does for ten years. Whilst some watch the 2s/10s spread, the 3 month/10 year is the spread that the Fed considers to be the most reliable indicator of US recession and is something we will all be hearing a lot about in the coming days. Sentiment across equity markets has taken a big hit too, with Wall Street sharply lower and the malaise spreading quickly across major markets. Wall Street closed significantly lower on Friday with the S&P 500 -1.9% at 2801 and US futures another -0.6% lower early today. This has hit across Asian markets with that and a stronger yen smashing the Nikkei -3.0% lower and the Shanghai Composite -1.9%. In Europe the selling seems to be a little less precipitous, with FTSE futures -0.3% and DAX futures -0.6% lower. In forex, there is a mild degree of dollar gains today even against the yen, whilst the Kiwi is holding up well as sterling continues to bash around like a fly trying to get out of a locked window. With commodities, the safe haven vibe is still helping gold higher, but the move is restricted slightly from the dollar bounce today. Oil is being hit again, but around -1.0%, with risk appetite under pressure. After such a terrible set of Eurozone PMIs (with Germany being a prime reason) last week, today’s German Ifo data will be seen as another key indicator to watch today. German Ifo Business Climate is at 0900GMT and is expected to put the brakes on the decline with 98.6 in March (up from 98.5 in February). 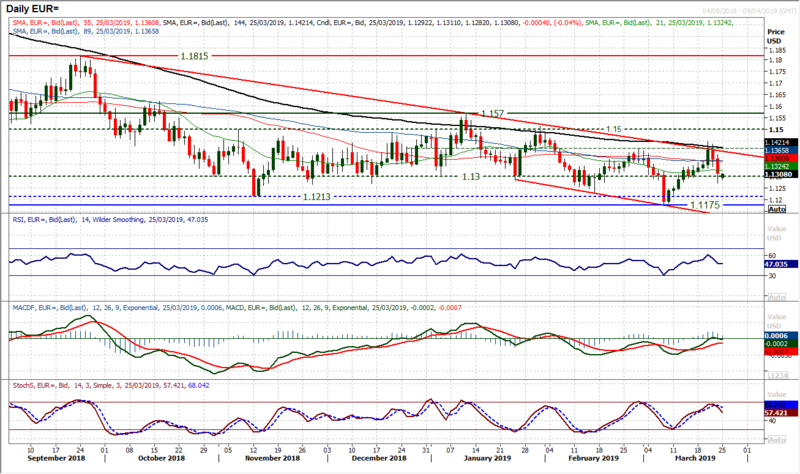 Sharp euro weakness on Friday came as the kiwi continues to perform strongly and EUR/NZD has broken down again. Continuing to trade within the downtrend channel throughout 2019, an intraday breach of the February/March lows just above 1.6400. This move has re-opened the 1.6320 low from December, but there is a real risk of the pair breaking down to new multi-year lows now. The move needs to be confirmed on a closing basis, but already the momentum indicators are shaping for the move. This comes with further downside potential on the RSI which is in the high 30s still, whilst the MACD and Stochastics lines are once more crossing lower in bearish configuration. The downtrend comes in at 1.6575 today, but an unwinding near term technical rally into 1.6405/1.6455 should be seen as a chance to sell now. 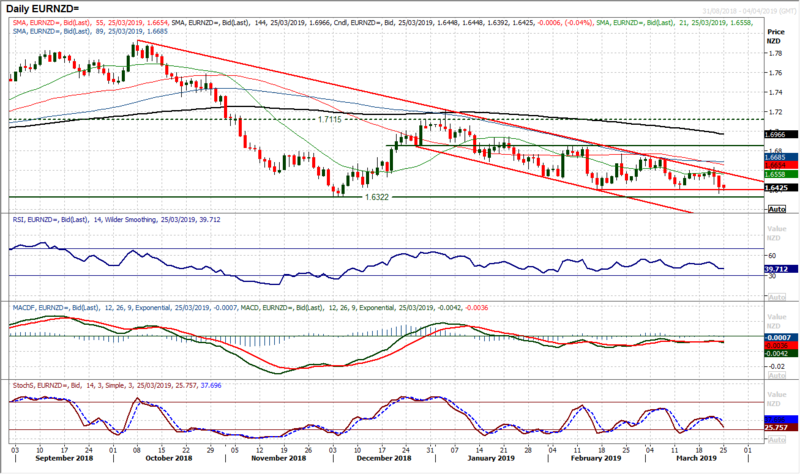 There has been a sharp swing lower on EUR/USD in the past two sessions. The recovery which had been building nicely in recent weeks has been knocked sideways and is on the brink of a move which would put the bears back in control of the channel lower again. 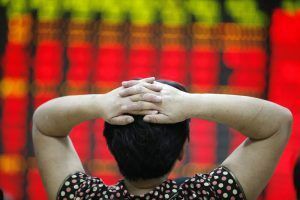 For months, the market has looked at the old floor around $1.1300 as a gauge of sentiment and a decisive close below would really signal that the selling pressure is ramping up once more. There has been a downside gap this morning which has left $1.1313 to be filled, and if the gap is “closed” then it would be more of a negative signal once more. The Stochastics crossing lower is a concern, whilst if the RSI went back below 40 and MACD lines also crossed lower it would confirm bear control. The hourly chart shows a negative bias and resistance $1.1320/$1.1350 now being an are the bulls need to conquer. A close below $1.1270 opens the $1.1175/$1.1215 lows again. Given the risk negative support that the dollar found across many majors on Friday, the fact that Cable closed over 100 pips higher again just reflects the focus the market has on Brexit right now. 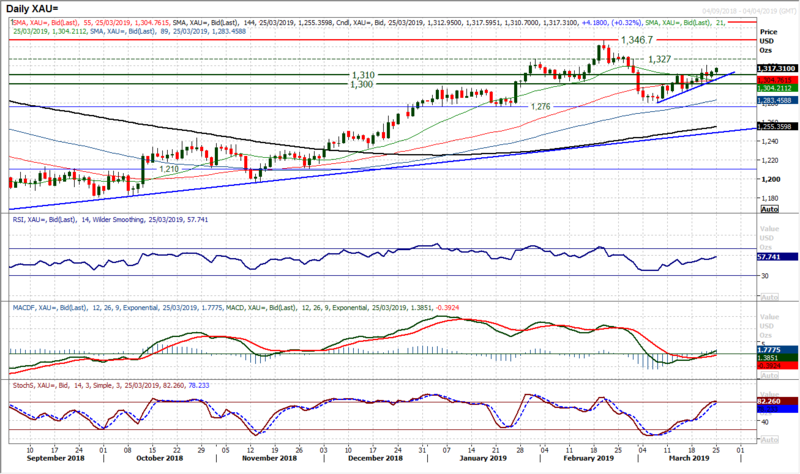 The recovery has helped to steady the nerves of a corrective move which was threatening to accelerate lower. Holding above $1.3000 was a positive for sterling, and given the uncertainty of recent weeks, it is interesting to see the momentum indicators actually fairly settled and benign. There is a mini downtrend of the past nine sessions which has capped the rebound this morning, but this is more likely a wait and see approach to what Brexit will throw at us this week. Above $1.3250 opens $1.3300. There is still the gauge of a near term pivot at $1.3150, with support $1.3080/$1.3100. A mild consolidation turned into something far less benign last week as USD/JPY turned sharply lower in the wake of the Fed. A could of decisive bearish candles in three sessions has now changed the outlook. Breaking initially 110.25 support and then the neckline of the old breakout at 110.00 means that the technical configuration is building lower highs and lower lows suddenly. Breaching a ten week uptrend, the market is below all moving averages and momentum indicators look far more corrective. A bear cross on MACD comes with the RSI and Stochastics falling at their lowest since mid-January. There is now a band of resistance between 110.00/110.35, whilst the market needs at least a move above 111.00 to see the bulls back in control again. 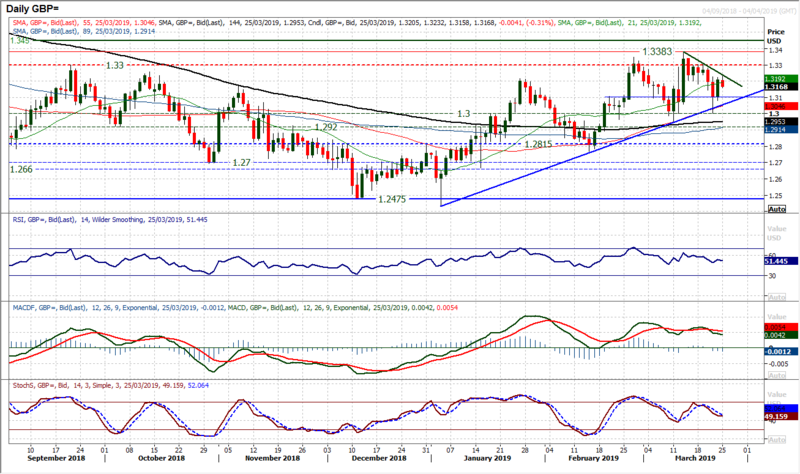 With risk negative across forex on Friday there has been a basis of support for gold. The recent two week uptrend is playing a frequent gauge for the bulls to use as their trigger to re-enter the rally which is looking to pull higher and clear of the long term pivot at $1310 now. There are still question marks over this breakout as the recent candlesticks have been a little mixed and lacking real conviction, but for now weakness is still a chance to buy. Maintaining the support of $1298 as a minor higher low would be seen as near term important level for the bulls to hold now. 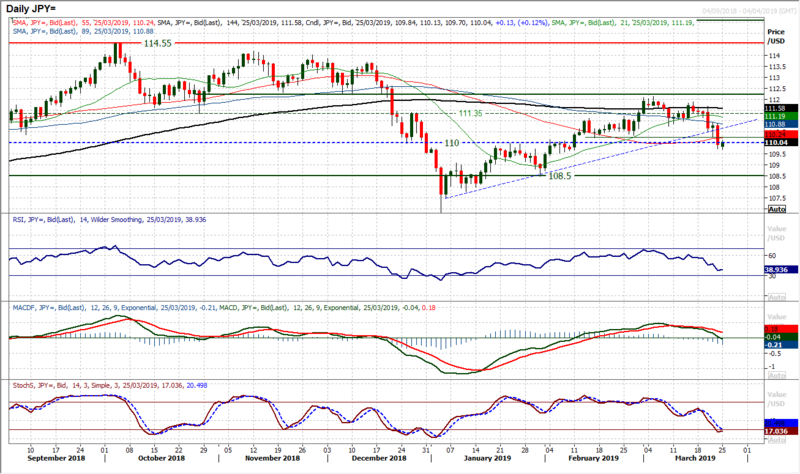 Momentum indicators are rising with the bull cross on MACD and Stochastics rising. The bulls will be eyeing the recent high at $1320 whilst the resistance of February highs between $1327/$1333 would be the next test. Can the bulls release the shackles and trade clear of $1310? The early move higher today is encouraging. A close above $1320 would be bullish and open $1327/$1333 as the next band of resistance. After such a solid and consistent run higher, the bulls were hit with a corrective move on Friday which is dragging the price lower. 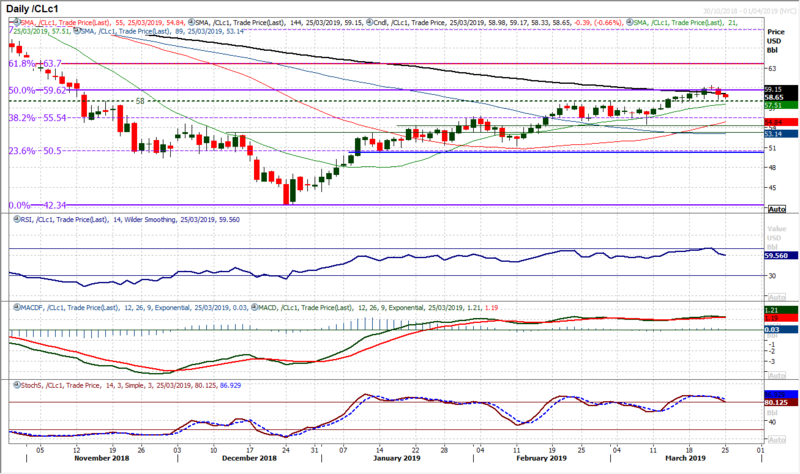 Since the breakout above the medium term pivot at $58.00 this has become a basis of support for a correction. It is also a point at which the bulls will now be looking for support to build. Having left a range of old highs in the old range during February between $57.50/$58.00 this is supportive. The RSI has slipped back from 70 but as long as a correction holds above 50, it would simply be considered an unwinding move. There is resistance now at $60.40 whilst the 50% Fibonacci retracement at $59.60 is also a gauge of resistance again. The hourly chart shows the bulls are under a little pressure and a confirmed move below $50.75 reaction low would raise an eyebrow. Initial resistance between $59.20/$59.65. 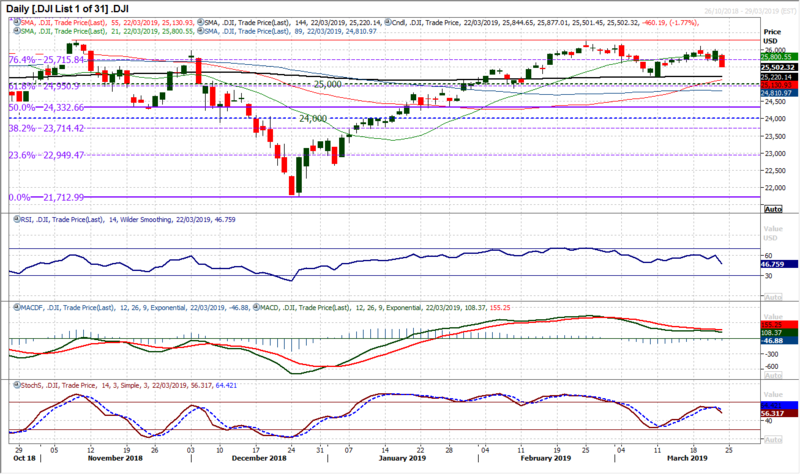 The recovery on the Dow has taken a significant hit as a decisive and strong bearish candle formed on Friday. Closing at the low of the session may have only been a nine session low but it shows that with the momentum of the swing lower, it is on its way for a test of the February reaction low at 25,210 now. Momentum indicators are all deteriorating now, with the RSI below 50 and its lowest since early January, whilst MACD lines are bear kissing lower and the Stochastics have crossed lower. Intraday rallies are struggling now with three bear candles in the past four sessions. The hourly chart reflects all these corrective signals, with initial resistance at 25,720 under 26,000 area. Below 25,210 opens 25,000.